The nearest international airport is Frankfurt. The nearest large trainstation, with trains arriving from all of Europe, is Saarbrücken. Other airports with international arrivals are Hahn (Frankfurt) and Luxembourg. The Lab in the Göttelborn Coal-Mine is located 20 km northeast of Saarbrücken in southwest Germany: the state is called Saarland and borders on France and Luxembourg. Travellers arriving by airplane (to Frankfurt/M airport) need to board a train to Saarbrücken, the regional capital. After landing in Frankfurt/M, determine which terminal in the airport you are (it depends on how you arrive, there is a Terminal 1(A, B, C), and a Terminal 2 (international); one terminal has a long-distance train (ICE) station, and one, Terminal 1, has a trainstation underneath for the regional trains. Train tickets at Travel Center (below ground) are E 24.oo from Frankfurt/Airport to Saarbrücken, and in 2 hours and 30 minutes you are in our state (Saarland), by a direct and very easy REGIO train, via Mainz. There are also faster trains via Darmstadt (ICE cost a little more and take 2 hours). [It appears that this service, as of 2011, is not available anymore. 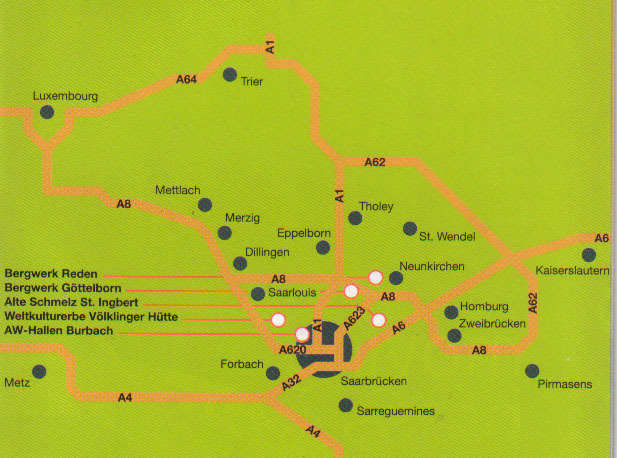 The Interaktionslabor is looking into alternatives, and they would be to look for available bus connctions via Idar Obersetin to Saarbrücen Main Station [ http://flyhahn.com/frankfurt-hahn-airport/trier-frankfurt-hahn-airport-bus-route-timetable.htm] or avilable bus connection to Trier and then arrange for a pick up by a personal vehicle. If you land at Luxembourg airport, please let us know you arrival times, so that a pick up might be arranged with the artists traveling to Goettelborn from Luxembourg City. There also should be bus connections from Luxembourg Airport or Luxemborug Gare to Saarbrücken Main Station. look at the yellow departure time schedules inside the station: every hour there is a train going, probably from platform 11b, in the direction of Wemmetsweiler or Lebach, take such train and get off at the first or second stop (11 minutes), when the signs say QUIERSCHIED, which is the village near the Mine where the loc al hotels are, 5 minutes from the Lab. However, with our new Guesthouse being located on site (Mine), you will need to take a cab from Quierschied to Göttelborn Coal Mine. There are also buses departing for Göttelborn, in front of the Saarbrücken Trainstation, where you will see a street with bus stops/bus terminals. The departing buses will travel to the right (in direction) from where you come out. There are posts where buses leave, ask for the bus to Göttelborn or look at the small black and white bus schedules posted at the bus stops. The bus to Göttellborn has the number 6333. There may be other number/buses going in same direction. Traveling from the East towards the Southwest, you might be approaching Saarbrücken via the A6 motorway from Frankfurt, and Kaiserslautern. If you are coming from the Frankfurt autobahn, stay on the A6 until you enter the Saarland, and then take the Neunkirchen exit, where the A8 leaves off towards the direction of Trier (A1). You will stay on this motorway for only about 10 minutes, and you already see the exit sign "Göttelborn", and you can also see the White Mining Tower on your left. You just follow the signs into the village of Göttelborn, drive past the church, turn left into the main street, and when you get to the village center (there are two banks, on either side of the street), take a left turn into the parking area for the soccer stadium, which is also the entrance street to the Mine. You are there. Since 2005, our lab participants are accommodated in the new GUEST HOUSE located inside the Coal Mine Campus. The Guest House has 9 rooms or suites, many of them with double beds to allow accommodation of up to 18 participants. A kitchen is available for breakfast, and a nearby restaurant on site also serves breakfast and lunch. Additional hotel accommodation in the nearby village of Quierschied (10 minutes). The Lab is in the Coal Mine (Göttelborner Bergwerk). Main entrance is through the newly reconstructed IKS Workshop Building, to which the new Guest House is attached. Inside the Workshop Building is the new Gray Gallery which serves as exhibition space and event space. The lab traditionally takes up residence in the large KAUE building to the north of the workshop building. The lab is located inside the Schwarz-Weiss KAUE, 2nd floor upstairs.